If you missed Raechel's Farmer's Market Feast cooking class at the beginning of July you can hear all about it as well as get the recipes to make at home. Even if you made it out to the event, be sure to snag the recipes! 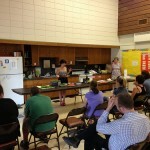 The Farmer's Market Feast cooking class was centered on preparing local summer vegetables in an easy and affordable way. We had a wonderful evening of food and fun talking about our favorite warm-weather plant-based dishes. For the class we made four items: Jicama and Radish Salad, Basil Walnut Pesto, Roasted Farm Fresh Carrots, and Raw Strawberry Crumble! If you'd like to get the recipes for each of these dishes, head on over to Rebel Grrl Kitchen and get inspired to make dinner tonight with fresh summer vegetables! For the third year, the Minnesota State Fair will host a vegan main dish competition. Register online by August 6th to participate and see your dish in the Creative Activities Building! We are seeking the most tasty and easy to prepare main dish that supplies a complete protein. Salads are excluded. For your vegan main dish simply use ingredients without animal products. Registration is required. Entries in this lot must be registered by 4:30 p.m. Tuesday, Aug. 6. Entries in this lot must be delivered on the west side of the Creative Activities building between 8-11 a.m. on Sunday, Aug. 18. Entries should arrive in a disposable container, containers will not be returned. Entries should be delivered cold, we will re-heat before judging. One entry per person. Recipes should include 12 or fewer ingredients. Salt, pepper, cooking oil, water and garnishes do NOT count as ingredients. A packaged food or product counts as one ingredient, i.e. box mix or bag of mixed vegetables. Fruit may be used. Entries must be submitted with 1) the recipe typed on one side of an 8 1/2" x 11" sheet of paper, typed on the reverse side 2) contestant's name, 3) street address, and 4) telephone number . DO NOT send in this sheet of paper with your registration. Bring it in with your item. Florence I. Brammer will award a vegan cookbook to the winner of Vegan Main Dish. CAA is hiring a part time Event Coordinator to plan CAA events. CAA organized a number of events throughout the year including our Veg Week events, a vegan Thanksgiving Potluck, food giveaways, and more. The Event Coordinator will oversee several key CAA events. The first is Veg Week, a week-long series of events including potlucks, dineouts, a feed-in, film screenings, and more. Other events may include our annual vegan Thanksgiving Potluck, food giveaways, a chili cook-off, and other events as time and volunteer support allows. 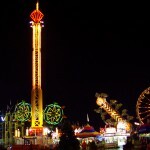 Plan and execute fun, informative events that highlight various aspects of our work. Events may focus on factory farming and animals, education about plant-based eating, sharing vegan food, or creating a animal-friendly community in the Twin Cities. 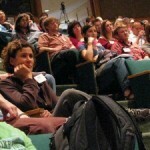 Work with volunteers at events to make sure they know what their jobs are, and provide supervision for the whole event. Provide volunteers with the opportunity to make a big difference for animals and foster an animal-friendly community in the Twin Cities. Reach new people who are interested in learning about animal agriculture and plant-based eating. Help foster a community of animal-friendly people in the Twin Cities. Gain skills in interpersonal communication, campaign coordination, and logistics. Contribute to a successful organization and movement. Creating lists of supplies, volunteer schedules, and checklists for events. Arranging for transportation, purchase of supplies, and equipment rental. Keeping detailed records of volunteer participation at events. Recruiting and training volunteers to help with events. Supervising events as a whole to make sure they are on schedule and going smoothly. A strong desire to educate the public about animal cruelty and compassionate eating choices. Strong communication skills and the ability to work work with volunteers to plan events, as well as the ability to given clear directions to volunteers at events. Strong organization skills and a keen eye for details. You must be able to walk through all aspects of an event in your head in advance in order to properly plan for an event. Occasional evening and weekend availability as most of our events do not take place during standard work hours. The ideal candidate will have experience organizing events and managing volunteers. You will need to be self-motivated and self-sufficient. This position requires computer work with our databases, planning software, and email lists. You should be comfortable spending a significant portion of your time using a computer. You should also be comfortable following up with volunteers on a regular basis through phone calls, text messaging, email, social media, and other forms of online communication. To apply, please send a resume and cover letter to application-2013@exploreveg.org. Submit your resume as an attached PDF or plain text file. Alternately, you can provide a link to a web page or PDF. Please include your cover letter in the body of the email. Your cover letter should explain why you are interested in this position, and why you are passionate about working in animal advocacy. Vegan candidates are encouraged to apply and will be given preference. Applications are due by the end of Friday, August 2. We plan to do interviews between August 16, 17, and 20. This position is for 10 hours/week and pays $10 per hour. We do not offer group health insurance coverage. There is no paid sick or vacation time. The new hire will start in early September. This position will be staffed for 35 weeks (during the academic school year). Compassionate Action for Animals is looking for an Outreach Coordinator and an Event Coordinator to oversee major initiatives in our campaign for the reduction of farmed animal suffering. Duties commence in early September and continue for 35 weeks, through the academic year. Each position pays $10 per hour. We encourage and prefer vegan applicants. Candidates interested in either opening or both must submit a resume and cover letter to application-2013@exploreveg.org by August 2. We will hold interviews on August 16, 17, and 20. Compassionate Action for Animals is looking for an Event Coordinator and an Outreach Coordinator to oversee major initiatives in our campaign for the reduction of farmed animal suffering. Duties commence in early September and continue for 35 weeks, through the academic year. Responsibilities of the Event Coordinator will include managing important CAA events, such as Veg Week, our Thanksgiving Potluck, food giveaways, and a chili cook-off. The Event Coordinator will be in charge of organizing engaging, informative events that contribute to our mission of spreading awareness and interest in the vegetarian diet. These could pertain to factory farming, sharing knowledge and samples of plant-based food, or building a community with compassion for animals in the Twin Cities. The Coordinator will offer CAA volunteers the chance to improve the condition of animals by providing event supervision, managing volunteer schedules and duties, and directing the volunteer team in carrying out logistics, advertising, cooking, setup, and cleanup for events. The position requires a commitment of 10 hours per week and pays $10 per hour. For more information about this opening, see the full job posting. The Outreach Coordinator position consists of supervising CAA's leafleting and tabling programs, through which we distribute pamphlets about factory farming and vegetarianism or put up educational tables and interact with the public, respectively. The Coordinator is expected to connect with the masses, especially our target audience of young adults, at local events by effectively supplying information about factory farming and plant-based eating. He or she will help volunteers make a positive impact on animal lives by directing volunteer participation at outreach events. This job requires a commitment of 15 hours per week and pays $10 per hour. For further details on this opening, see the full job posting. Candidates interested in either opening or both must submit a resume and cover letter to application-2013@exploreveg.org by the end of Friday, August 2; we will hold interviews on August 16, 17, and 20. Please send your resume as an attached PDF or plain text file, or as a link to a webpage or PDF. Place your cover letter into the email's text, explaining your interest in the position(s) and animal advocacy. We encourage and prefer vegan applicants. CAA thanks you for your interest in helping animals and looks forward to receiving your applications. CAA is hiring a part time Outreach Coordinator to oversee leafleting and tabling. 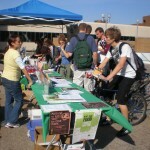 CAA passes out leaflets and sets up informational tables at colleges, concerts, and festivals. The Outreach Coordinator finds appropriate venues to conduct outreach, schedules outreach, recruits volunteers, and conducts outreach with volunteers. Efficiently provide information about factory farming and vegetarianism to large numbers of people. Make information about factory farming and vegetarianism available at local events that are attended by our target demographic – young adults. Provide volunteers with the opportunity to make a big difference for animals in a short amount of time. Communicating with venues and events about regulations, event ending times, etc. Keeping a supply of outreach materials at the CAA office and ordering more when necessary. Arranging for transportation of materials to outreach locations. Keeping detailed records of the outreach conducted and reporting results to volunteers, your supervisor, and allied groups. Planning occasional larger outreach events with a committee of volunteers. Recruiting and training volunteers to help with outreach. Friendly and outgoing, strong communication skills, and the ability to interact positively with a wide variety of people. Availability late in the evening for concerts and during school hours for colleges. This position is for 15 hours/week and pays $10 per hour. We do not offer group health insurance coverage. There is no paid sick or vacation time. We are excited to announce a new and informative way to help Compassionate Action for Animals and encourage people to move towards a plant-based diet! An anonymous donor has committed to contribute to us when you like or share the What Came Before video on Facebook. What Came Before is a 10-minute video narrated by Steve-O. He introduces us to Nikki, Symphony, and Fanny – animals that have found refuge at Farm Sanctuary. He shows us what the lives of these animals was like when they were on factory farms, and encourages us to embrace our empathy for these animals. We want to expose this video to thousands of people, and with your help we can make this happen. If you like this page, our donor will contribute $10. If you share this page on Facebook, our donor will contribute $25. Please like the video, share the video, and encourage your friends to do the same. The donor will contribute up to $15,000 to Compassionate Action for Animals based on how widely the video is distributed. With the donor's contribution, we will be able to continue our advocacy on behalf of animals. Join panelists Greta Gaard (UW-River Falls), Mark Berkson (Hamline University), Deane Curtin (Gustavus Adolphus), and Mark Nunberg (Common Ground Meditation Center) on Friday, June 27th at 7pm at Common Ground Meditation Center for a talk on humans, animals, and non-harming in the Buddhist tradition. This panel and community discussion will focus on the ethics of our relationships with animals, issues surrounding animal advocacy, and what Buddhist texts and practices can tell us about our connection with other species. The event will take place at Common Ground Meditation Center, 2700 E. 26th Street, Minneapolis from 7-9pm and is open to the public. Contact Mark Berkson for more details or with questions. Their Lives, Our Voices is back after a two year hiatus. Join us for a day of workshops and presentations about farmed animal activism. Join activists from around the country at the 2013 Their Lives, Our Voices animal advocacy conference! Hosted by Compassionate Action Animals, Their Lives, Our Voices aims to empower animal advocates in their efforts on behalf of farmed animals. TLOV features engaging and informative discussions led by leaders in the movement. This event will consist of two tracks of speakers focusing on activist strategy and skills development, with a kick-off keynote from Nathan Runkle of Mercy for Animals. The day's schedule will include talks on grassroots organizing, effective lobbying and political action, educational outreach, event planning, tabling strategy, ecofeminism, nutrition, and more. Attendees are encouraged to actively participate. And of course, a conference like this is a great networking opportunity where you can meet like-minded people who share your passion for helping animals. Come make TLOV a success and register today! The conference will be held on Sunday, October 27th at the University of Minnesota campus in Minneapolis. The event will run from 9:45am to 5:20pm. Registration is $20, with a $10 level for students and low-income individuals. Conference attendees are also encouraged to attend the second annual Twin Cities Veg Fest on Saturday, October 26th. 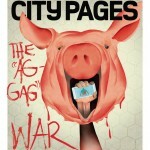 City Pages recently ran a story about how undercover animal rights activists are winning the ag-gag battle, in which it tells of how giving people information they deserve is leading to a self-imploding ag-gag movement. Though Minnesota did not pass the ag-gag bill that came through legislation several years ago, many other states are still attempting to pass laws that will outlaw the filming of cruelty on factory farms. Even though several states already have this law in place, the ag-gag movement seems to be losing steam and imploding to some extent. One of the main reasons that activists are winning out over ag-gag bills is that people want access to information. Many people do not know where their food comes from, and seeing these undercover videos is a way for them to be exposed to what exactly they are eating. Read the entire City Pages article on their website.